Storytelling continues to evolve as important aspect in communications - not just presentations, but even leadership development, blogs, and gaming. A challenge is ensuring the story connects with the audience. At Villanova University, student guide shows campus location where lore says Jim Croce inspired lyrics for song "Time in a Bottle". Boomer parents all know Jim Croce; Gen-Y potential students don't. The location of national association headquarters in Chicago is office building in opening to first "Bob Newhart Show". I'd show building picture to new members (my age or older) in orientation class and it's interesting -- not at all notable when class not old enough to know the show. Both stories can be retold in ways that capture interest and imagination of those hearing them. For example, part of lyrics to "Time in a Bottle" could be read at location, and explain former student became famous, then died before song #1. Location of association headquarters building across street from Chicago Tribune, next door to Wrigley Building and near famous shopping - so "location, location, location" is better story -- or show YouTube clip of TV show's opening (since has catchy music) and noting HQ building. As we lead, inspire, teach, guide those who listen to or read our stories, ensure material has elements with universal appeal -- its level, drama, context. Visiting universities along East Coast … During campus tours there’s note something is “free” … such as, freshman get free laptop, or sodas free 24/7 in student lounge, or printouts from library printers are free. Typically if I look over at other parents they're smirking too. Each college is minimum $34,000/year tuition (plus room/board/fees) – so after that, then free laptop, soda or printouts. Not exactly free - Someone pays. Associations sometime offer free courses or other programs. I wonder if members smirk because they know they may have already paid for free program through dues. Maybe free, discounted or subsidized programs should be clear about where funding came from when promoted – offered as part of dues, or completely sponsored by generosity of sponsors, or offered at no cost due to excess income from non-dues revenue. There is no free. While driving many hours in thunderstorms last night, wishing I could use cruise control - but learned that lesson. Several years ago my car hydroplaned on very icy road (Turnpike), spun around several times, and landed in snow bank. No damage to me, lots to car. After relaying I was driving 25 mph, with cruise control, police officer said "don't you know to never drive on icy or wet roads with cruise control on - can cause rapid acceleration and hydroplaning". No, I didn't know. Where would I have learned that? See these tips for driving in the rain. Was so frightened by experience, and so surprised okay, that phoned people from snow bank to say grateful to have them in my life. Very glad I did. Why don't we make those calls when it's not resulting from a huge scare? 2. If you're grateful to have certain people in your life - tell them now. Don't wait. Millions are already viewing web sites on mobile phones. Many did not design association sites (and/or blogs) anticipating that. Daily Blog Tips includes link to mobile phone emulator so you can see what your site currently looks like to those using mobile phone with Internet browser access. Type in your site's URL, click Submit, and when displays you can use screen down feature on phone. Or test your site using your own mobile phone's access. And this one posted by a colleague: "The best interviews I've conducted have been over golf or fishing. With those you get a pretty good idea how someone will react in a frustrating situation." Honestly, if anyone ever made me sit in a fishing boat all day "as a test", either I'll have to have an iPod full of NPR stories (free podcasts), a book, or I'm jumping off the boat and swimming to shore. While "teach a person to fish" parable has great application with employees, likely shouldn't involve actual fish. Wonder how you'd score on those evaluations? New association executive (and blogger) Maddie Grant is deciding to stop some association activities - to see if anyone notices. That system works. I may have had a print newsletter forever except 15 years ago the printer screwed up, it was never sent, and no one missed it. My membership e-newsletter has no particular frequency (often sent several times a week) - but if whole week goes by without sending one we get barraged with communications about whether or not our email system is having problems - they miss it. 1. Let's stop and see if anyone - or how many - notice. 2. Let's change, and poll them AFTER to see which way they prefer. Asking what they prefer BEFORE trying a change makes it somewhat impossible to evaluate options. The latter is what turned our Annual Membership Meeting (governance section of conference) from a 2 hour meeting to a 15-minute meeting. When 95% of attendees said they liked 15 minutes more, 15 minutes stayed. Stop and watch; or change, then poll. 1. You're feeling ‘stuck’ in your life. It’s not a full blown “is this all there is?” angst, just a boredom and nagging sluggishness, a ‘today is just another yesterday’. Good coach helps identify, articulate, and plan. Rekindles the fire, excites you about personal goals. 2. You're facing a life-changing experience. Whether or not your experience is frightening or fun, a personal coach can help put everything in perspective. In my case, being paycheck-free and with discretionary time for myself was a scary thought. Needed someone to help address the larger-than-life issues. 3. You need a third-party voice in your life. Let’s face it, your mother isn't disinterested third party: she had dreams and hopes for you, and values she thought would work for you. A coach, however, starts from YOUR dreams, and YOUR values, and helps you find the way to bring those dreams/values into your life. 4. You just have a problem. Could be new one, or one of those ‘evergreen’ ones (like weight, or frustration with a relationship). A coach can help: she/he steps back and looks at the issue with fresh vision and helps you discover new perspectives and potential solutions. Tomorrow at midnight the much anticipated release of Halo 3 happens ... and like Halo 2 release I'll be outside a game store with my 15 year old son for hours so he can get it, on a school night at midnight. Estimates over a million copies pre-sold (we're in that count) and 2.5 million copies may be sold first day. Many electronics stores have "Halo 3 Countdown" widget (pic) on web sites. With those staggering numbers, association executives shouldn't ignore the volume who game, and potential impact as they're current/future employees, CEOs and members. "Halo effect" often refers to having a positive impression of someone or something based on a first attribute (such as being beautiful) or past experience (such as Apple products) -- where one or few positives leads to belief there are many more positive attributes. 1. Gamers in Halo have to be collaborative to be successful. My son routinely shows others in his "clan" (gaming group) how to improve, so he can win. Also have to be good at multi-tasking and problem-solving. 2. Possible there's more "leadership development" in years of gaming than a day-long leadership seminar or retreat with instructors. Ask a gamer about leadership. 3. Failure is part of gaming experience - leads to future success. Are we willing to take chances, and "fail our way to success"? 4. Do we create a buzz for product or program releases? Where's the countdown widget on our association sites? 5. Gamers already oriented to world without geographic barriers - bring that to workforce. Online gaming is with kid next door, cousin across country, friends from class, others throughout world. Not loner experience as often perceived - broader and more interactive than most who don't game. 6. Endorsement potential for best gamers higher than many professional sports athletes. Considered cyber-sport by this generation, even if parents don't think so. If targeting demographics, have you thought about gamers? 7. Builds technical skills. Reports that surgeons who game better at technical part of certain procedures than non-gamers. 8. What will gamers think when have on-line or other experience with our associations -- for education, research and collaboration. Do we seek them out to help improve our development? 9. Gamers don't see down side to honesty, even if negative comments. Leads to improvement. Very impressed with association executive Jason Della Rocca from International Game Developers Association (IGDA). His membership largely under 30 and industry that embraces best of gaming qualities, because it has to. Very creative association, site, approach, individual. Jason guest-blogged at ASAE2007 and posted negative (and positive) comments about programs. My guess is comments will be considered by future planning group, and reflect opinion of others who worry about "being negative" and don't post. And to give ASAE credit, they encouraged post and then made him regular guest blogger. What approach do associations often take with encouraging honesty and insight about their programs? If many members (and employees) are likely among the huge demographic that game, do we provide a collaborative environment where they want to participate? Where's our Halo effect? Got email response to recent article, with more tips for wireless and electrical access when traveling. 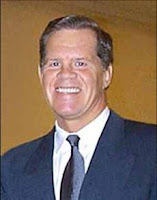 From Jerry Matthews who relays, "As you know I travel extensively as a consultant, and have [many] Internet complaints." Mac user too. 1. Travel with ethernet cable. Pays for itself first time. 3. Get an iPhone which has unlimited Internet access with real web pages and unlimited e-mail... or other cell phone with access as backup. 4. When you enter your hotel room check out wireless access before you unpack. There are "dead zones" (or other excuses) and if your room is in one you can move immediately. 5. Join Wyndham ByRequest, a free membership that automatically gives free Internet access and free long distance. (And a welcome batch of munchies). No minimum stays required. Not that many Wyndhams but my choice every time. 6. Travel with an outlet splitter. Allows two plugs for one outlet. Good for hotel rooms but also for airports when another traveller beats you to the only outlet. 7. Delta has small desks/counters and plenty of outlets in a "Changing Center" in their gate areas. 8. If not familiar with hotel do not believe their Internet site call them directly - not national reservations center - and ask for a manager to get the truth (hopefully). Wore my old POW Bracelet today (pic) in honor of Lt Col. William Potter - because local newspaper had full-page ad reminding it's POW/MIA Remembrance Day. Got bracelet in the seventh grade. Until Google, only knew what bracelet inscribed - name, rank, date MIA. Would not have known his story or that remains identified in 1995. Web also includes ... how returning POWs might receive a hundred bracelets in the mail sent by those who wore name on bracelet, pictures/stories of those missing or killed - and remembered on "virtual walls", and history of bracelet itself. Many Associations have buildings, libraries, rooms, scholarship funds, awards, and more named in honor of someone. But do later generations of members and scholarship or award recipients get those stories? Do we provide remembrance? Maybe we should each set aside time each year to get the stories of those who earned their name in our association histories and share them - and/or set up a "virtual wall" on our sites so legacy can be found. They aren't just names. We can provide remembrance. I'm far more likely to make an immediate donation to an online contribution request if a PayPal option. Degree of inconvenience to get up, get credit card/check, type info. Many will skip - or delay and forget. PayPal takes seconds to send. If haven't used, PayPal is preferred method of eBay payments - stores personal/business credit card info, and/or checking account info - to generate instant payments when you request. Sign-in and send. Doesn't forward your card info. No need to type mailing address as auto-populates. Might make sense to add PayPal as an option for charitable, PAC and other giving (when allowed in state law). Even if your ecommerce system has better rate - end user likely has to type lines and lines of data. Consider convenience of PayPal and clear potential to capture contributors who may not otherwise give. Make it easy. 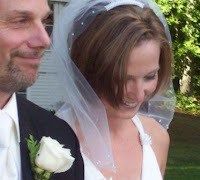 Ben Martin's blog relays a friend/AE/blogger's wife in a car accident. Encourages contribution to help family - with online PayPal donation form. Ben makes it easy to give. PayPal can potentially improve your association fundraising activities. My friend/colleague Jerry Panz has a file for his officers/staff named "When Jerry Goes to See Jesus", to assist them in the event he dies unexpectedly. To quote Jerry, "the members should be left with some suggestions about how to proceed." Good idea for us all to have one of these, if don't already. 1) Be happy. I am! 4) Signature cards are changed annually with the election. You might want to add the COO as a signatory but do notify the bank of the last checks that I signed for each of the accounts. 5) Notify the CPA (name – phone #) Tell him that you may need his help and that you will notify him as to “who” the acting CEO is. 6) Call legal counsel (name – phone #) and get the password to open the following file: (filename)\Passwords.doc. There are other files that are protected in the Previous Years folders, too. The password for those files is the Password document. 7) Notify state and national association of my death and who is now the acting CEO. 8) Decide on a Search Committee NOW. It may take months to decide and the current staff person already has a full-time job! 9) (Staff name) is also able to enter the safety deposit box but only historical information is stored there. Change the signature card as to who else may enter. 10) I have two building keys—one on my key chain and one in my wallet. I also have a key to the locked filing cabinet in my office. You need to get them. 11) In the (location) is a blank file with keys to the building, the petty cash box, and the locked box in the storage room near the (location) where all of the office keys may be found. 12) The checklist for doing the month-end account for each entity can be found at (filename)\Month End Checklist. You will also want to look to see if I have started the monthly accounting for the (subsidiaries) by looking in my locked file for the three folders for (subsidiaries). Finish the checklist and close the month in (accounting software name). It is best accessed and followed by someone with accounting experience. The month must be closed in (accounting software) under Tasks - System – Change Accounting Period. (Name of CPA), CPA will find an employee/temp to help with this as necessary. 13) Change (membership system) database to reflect “who” is the current CEO. Have someone check (national membership system) for the change the day after the transmission. 14) There is an insurance policy on me paid by the corporations. Also I have a personal life insurance policy through the health care policy. (Name) is the beneficiary for both. Please also remind her to contact (insurance provider) about the car, life and house insurance. Remind her to contact (personal attorney) about another life insurance policy, too. Growing up in Miami (pic), I remember Nick Buoniconti as a Miami Dolphin - and news his son Marc suffered a paralyzing spinal cord injury in a college football game. Nick and Marc are leading advocates for spinal cord injury research through their Miami Project to Cure Paralysis. Recently, the unexpected development of severely injured NFL football player Kevin Everett having movement resulted in sportscaster Bob Costas talking with Nick Buoniconti. The apparent reason for success: the physician in the ambulance on the field that day attended a seminar where a cutting-edge technique to preserve spinal cord functionality was instructed - and he applied that info. Association executives are often in position to determine, suggest or influence content in courses and publications. Also have challenge of ensuring those who need info get it. Finding out what cutting-edge practices are happening in our respective industries, and providing to our memberships matters. It changed the future of Kevin Everett. 3. Purchase investment/retirement property now, while you’re still working. Easier to do while have a salary. Consider renting it to help fund. Provides opportunity to live part of the year in community where you think you’ll want to retire. 4. When to go: while you’re healthy, while still at top of your game, and when you know you’re bored (said not a good sign if look for controversy to break boredom). 5. Don’t underestimate the enormity of the financial and emotional change. Have a plan. At a recent dinner my association president asked each at the table to tell something interesting about themselves others might not know. Responses included owning a fleet of Harleys; serving as accountant in Travelgate scandal; spending month in Peru with naked tribe; to riding a paddle boat 3 times a day for past 10 years - except when water completely freezes - and often bringing along ducks (pic). Other question - a unique manufacturing place they toured - learned about Cape Cod potato chip factory, Cranberry World, Cadbury chocolates, others. Group definitely got to know each other better, and conversation interesting. Everyone has a story, and asking those two questions are ways to bring it out. Local newspaper has interesting article about bestselling author Tess Gerritsen (pic - de.wikipedia) - who lives in Maine. In addition to writing bestsellers, she has a blog on the publishing business, and interacts with frustrated and successful writers. One post includes letters from complaining readers -- finding language "filthy", bemoaning killing beloved pet/character, and character depictions insulting someone or some group. Her current problem - getting home Internet connection fixed. Drives into town to respond to email and update blog - and guess what she blogs about? The service. 1. Couldn't tell you what restaurants I've been to, but sure remember properties with free wireless. 2. Properties saying they're wireless should include "in the lobby but not meeting rooms and guest rooms" if that's what they mean. 3. If wireless only in lobby, request guest room as close to (above, next to) lobby as possible and could work. 4. Always check to see if a neighboring property's wireless can be accessed. 5. One airport that gets it - JFK. First time I took JetBlue and saw hundred electrical outlets and free wireless, clear they understand business travelers. What's the deal with so many airports having handful of electrical outlets in terminal? Maybe travel with power strip to get power option at some airports? 6. Travel with long cables if don't like to be chained to desk in hotel room. Heard it's possible to bring travel wireless router to create freedom from wires, but haven't tried. 7. Annoying when facilities charge "$100" (or other amount) to provide meeting room access to wireless. Rather have it buried in meeting room cost than charged for $0 cost item (if building has it, that is) - Essential now. 8. Unless absolutely no other reasonable choice, don't book groups where high-speed Internet can't work. Was invited to participate in retreat at facility with no-high speed Internet - so declined. Host said "we're in meetings all day, then group dinner, why would that be important". Hmmm - there's WHAT probability might need/want to work at night? 9. Bring Blackberry and laptop to site checks to see what happens. If problem, let attendees know. 10. Clearly phone plans for laptops ($30-60/month?) an option to high speed Internet hunt, and can bring 2-3 charged batteries (heavy) for no electrical outlet -- but would much rather have free wireless and available electrical outlets. Met the exec for Association of Running Event Directors during a session at ASAE2007. Originally thought name meant it's membership ran events -- but no, it's for those who direct running events, like competitive marathons and charity races. Indicated many don't seek legal, marketing, fundraising and other professional advice (ethics, award ceremonies, recruiting volunteers, walkers, kids, results, etc.) for these type events -- and it's why they exist. Many races are volunteer-run, and organizers don't think to get important info prior to planning. I wonder how many professional associations, which run charitable events (such as fun runs), think to check with and join the association with that expertise. These tips from their site about planning a successful charity race, including: 1. don't build budget around entry fees; 2. exploit publicity value; 4. devote care to race course logistics - many runners not there to support cause; 7. build as few turns and bridge crossings as possible; 9. don't run out of small/medium t-shirts; 12. place aid stations 1/8 mile away from mile marker; 13. always use paper cups with pre-poured water - never plastic or styrofoam. Site's blog has notable remarks too, e.g., if know in advance someone doing something unusual at race, let media know; and using flour to mark course could have you investigated for bio-terrorism. Tomorrow I'm participating in a "first annual" charitable running event in memory of the athletics director of my daughter's high school. Next year will likely donate a membership to their event director so has info that can further assist. Dues only $98/year. If my association ever plans a running event, seems like a logical place to start. As association executives, do we ensure we're checking with - and when applicable joining - other professional associations that can assist us? I'm a big fan of the TripAdvisor site. Allows researching facilities throughout the world, and allows participation in Forums on nearly any destination. Find info extremely accurate - because it's real travelers reporting on their experience. When conflicting comments it's often because a portion of facility has been renovated, another portion hasn't (good to know in advance.) Even if booked two years out, at least one month prior to meeting happening I look at recent TripAdvisor posts. Then either print user comments out or email them to facility (or facilities) being used. If users say the front desk is rude and in-room refrigerators are dirty, then know to follow-up to ensure doesn't happen when we're there. Comments not restricted to large facilities, it's locations of all sizes even in remote areas. TripAdvisor Forums are excellent for other purposes - from identifying great local restaurants, to unique or popular sightseeing options, to finding great personal guide. When my family took a recent trip to Prague, their Prague Forum helped us find an absolutely superb guide, Sarka (pic). Forum also helped find an affordable car service from Munich back to Prague - dependable option to work with our schedule. Try it for your upcoming destinations or personal travel. Wrote earlier how many share names with famous people. When seeing a famous name on my association's banquet guest list, the potential it's the real celebrity didn't cross my mind. But there he was. Decided not to go over and act star-struck or announce it from stage, but wanted to. What would you do if a famous person was at a random table at your banquet? How it works: Photo uploads to site where makes changes to create character similar to those on “The Simpsons”. There is max size requirement, must be picture of face, and hugely busy site (may get “try later” messages). Go to SimpsonizeMe.com. Declined an instructor request to turn off lights in class -- for PowerPoint. Being in charge has advantages, like ensuring light. Several blogs include PowerPoint woes (Jamie Notter, Mikie Rops, Seth Godin). My pet peeve - expecting students to sit in the dark for hours "to see". Quote from instructor (in sportive tone): "Miss Thang says lights are on." "Miss Thang" being me -- but no clue what that meant. Online research indicates it could mean authoritative, bossy, sassy, confident, ultimate woman "at least she thinks she is" and/or attitude "for all the right reasons." Could also mean "tan, perfect hair, 2% body fat" - guessing that's not it. 2. Selling something at registration and want them to come by? Put out bowls of chocolate candy bars and they'll stop by 2-10 times per day. 6. Small gift bags nice for speaker sleeping rooms, even if getting paid. Travel a hassle. They appreciate it. 8. Cheerful people at registration desk. Bring all registration back-up - When questions, show their own forms, in own writing. 9. Consider a theme party with DJ. Not all industries have extroverts, mine does, and they're fun. This year is tie-dye/Beatles theme (pic). Other year themes include: Western, hiking (park rangers, canteens), mystery (group characters from Clue, Nancy Drew, Inspector Clouseau), flannel (pajamas, togas from flannel sheets, flannel hats), Hollywood (ten different Dorothys from Wizard of Oz), the color Red. Advantages - decorations are attendees themselves (no cost), can be fun. 10. Follow up immediately - during convention. Conventions chance for many to ask you for something. Spend half hour each night following up on requests. Immediacy of response does not go unnoticed. If time to check/answer email, likely time for that too. 11. Have instructors using lavaliere microphones take pens out of coat pockets. AV guy said it's his #1 reason when complaints about "noise" from the microphone. 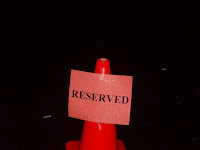 One way we thank Major Donors to our PAC is with "reserved" parking spaces at convention. Put orange cones in best parking spots. Arrived at midnight to find cars, not cones in best spaces. Checked storage - there they were. Car pulled out of a best spot .. Ran, grabbed a cone, put in space (pic), now ONE can park. Got 2 more (of 8), hunted around, no luck, pouring rain. Should I be stalking parking spaces with orange cones in the rain at midnight? YES. It's really hard to get large PAC contributions; this is easier. Tipping a bellman to handle cones (not handled, as requested) a better way to solve, but apparently none here until morning. Instantly emailed Major Donors to say cones not there, would keep working on it, and apologizing. Find managing expectations much better than surprising. 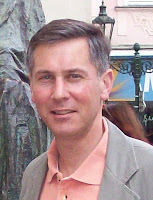 Responding to a conference question about finding his site, Ben Martin answered, then added "or you can Google my name – it comes up first". I thought it remarkable because I don't show up until page 2 on a Google search of my name -- and it's due to two blogs -- one I wrote for six days on the AE perspective of a convention in New Orleans; next because meetings blogger Sue Pelletier mentioned/linked to my posting about Zoomerang tips. Many share famous or common names; others (like me) with non-common names just share a name with someone doing more that leads to their higher Google placement. There's "another" Cindy Butts (pic) who has a prominent position with a police agency in the UK - and dominates our shared name in searches. She stops crime, is public with opinion, and apparently resigned from a board finding: "lack of any real leadership, proper accountability and a transparent and inclusive way of working." I like her. Everyone should Google their own name. (Note: put your name in quotation marks in the search so parts of your name aren't in results - like every occurrence of your first name.) Find out your first search appearances and what they're related to - as that's what anyone else who Googles your name is going to find too. If I have to spend an entire Sunday in the office working, at least I have the best new office supply to save time and document appearance - the Liquid Paper DryLine Grip (pic). It instantly and easily covers mistakes on paper simply by moving it across the error. No more waiting for other types of Liquid Paper to dry - or cleaning white marks on the copier because not patient enough to wait for it to dry. LiquidPaper.com has an online video showing how it works, if needed. This mini version for purses/briefcases. If you don't have it, get it. Until the ASAE convention, I had never heard of Technorati. It's a service that checks blogs and postings for words to follow (officer names, your name, your organization, your blog name, if you want to see if friends mentioned anywhere, etc.) Notifies you when those names are written about. Good way to assemble blogs you regularly read too. For blog owners it's a place to post blogs, with steps to "claim" your blog name (e.g., Technorati Profile). "Housing" in the middle of many things drawing millions of unique consumers to the site monthly- job ads, classified ads, pets, personal ads (as in, way personal), discussion forums, tickets for sale, volunteers, arts notices, lost/found, etc. Default is San Francisco postings, where it started - but easy to find own city/state postings. Once ran an employment ad on their jobs site ... mirrored what ran in local newspaper. Results were fast, but found around 80% of online applicants didn't follow directions -- i.e., said send cover letter - they didn't; 80% of newspaper ad applicants did include. 1. Look at their employee photos and descriptions. Wonder if my staff would hate or love it if I did this? 2. I love how people write on the web. This example from their "best of" section of an actual "lost pet" posting (worth reading; note - has expletives). 3. The simplicity of their Factsheet. 4. 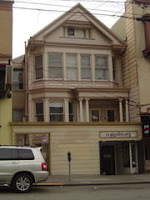 Total of 27 staff in their one office in San Fran (pic - from Wikimedia Commons). Went to Bar Harbor to run through the "avoid last minute surprise" pre-convention questions with resort manager (e.g., where does wireless work and not work, what are room service hours, if anything closes - what time are they closed, which sleeping rooms are impacted if dance music too loud, where to move breakfast if it rains, etc.) One question caused a different reaction - "Why are there tables instead of desks in the guest rooms"? Her response: "Our typical customer is the leisure traveler, not a business traveler." OHHHH -- so attendees at a convention in Bar Harbor should go to Acadia National Park (entrance less than a quarter mile away) and not sit at a desk in their hotel room working? 1. Call video and audio-casts "multimedia presentations". RSS feed them too. Length is very short -- and topics of general public interest. 3. A "For Teachers" button with curriculum and field trip information. Do we make it easy for teachers to find materials to teach about our industries? 4. Pictures show people enjoying various activities. Do associations give the impression something fun happens with membership or involvement? 5. Highlight their own commitment to environment and social responsibility - and clearly encourages it from others, with specific ideas how. 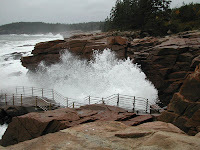 And if that isn't inspiration enough, there's always Cadillac Mountain and Thunder Hole (pic) in the Park to help. Have you ever noticed professional sports teams don't consider the timing of your meeting or conference? One advantage of a mid-September convention instead of our typical October dates is no potential baseball playoffs overlap. When we hit a second year in a row of Yankees-Red Sox playoff games (which led to World Series) during our meeting dates, it became clear to build the game into the conference at the last minute - versus having room full of people believe/know they were "missing something". When attendees follow a team their entire lives, they aren't going to become disinterested in a big game. Even a banquet sometimes needs to play to its audience. What we did: Shortened the banquet program (kept start time). Told attendees we'd announce early scores during dinner and what time we'd end. Hooked up projector to the TV in room where dance was scheduled -- and showed the game during the dance. Attendees enjoyed dancing and watching the game at the same time (imagine people cheering while slow dancing). Kept them connected with our event. Knowing a "big game" conflict helps to build around it. Any lead time lets you alter program, make "game" plans, add items with team logos, put baseball caps on the emcees, etc. When the Red Sox won it became one of the most memorable nights of any conference. We provided, instead of ignored, a shared experience. Side note about sports fans: Retired baseball, basketball or football players are big draw for trade shows (at least Red Sox, Celtics and Patriots players in New England). Many want autographs and pictures. 1. Don't do each other's jobs. Easy to fall into a trap of deciding to "help" run your spouse's association too - when they don't want or need a co-CEO. 2. Our professional mentors are not each other. 4. When you attend as spouse, forget you're an association executive. Even if you're dying to fix the AV or get their registration line to move faster. 5. Agree to be aggressive about saving money "just in case". Nature of association management is you stay until it's time to go - be ready financially. 6. Confidential info related to your position should never be shared - including with your spouse. Associations can have conflicting agendas. 8. There's natural idea sharing and stealing between association execs. Even at home. And if/when you have kids ... as soon as they walk it's not too early to teach to collate and help with lit drops for candidates. Skill-building 101. A product I frequently use at my association is Zoomerang -- It's survey software. Worth the money. Advantage to doing many surveys is allowing members to weigh in on a lot of issues. And if they don't, they can't say they were never asked. 6. When send email invitation be sure to tell how long it will take and why they should take it -- "This will take you two minutes to complete and will help guide our legislative agenda"
7. Subject line should sound immediate - "Need Member Input Now about (Issue)". If give too much time to answer a survey, they'll never answer. For online, one week is plenty. Keep questions short/simple. 8. Providing an incentive significantly increases responses - e.g., "answer by 4PM Friday to enter drawing for one of three $50 gift certificates to Amazon" or whatever. Our price point for response is around $50 - doesn't need to go higher but more than one helps too. Announce who won in e-newsletter. 10. Know Excel basics to use download results function. Also, if need to mail survey takers, include mailing address in name, street name, town, state, zip format (five different fields) on survey to later create labels. 11. I include the survey link in email as way to distribute -- prefer not to post on web site as non-members also go there. Use "one response per computer" feature so can't take multiple times easily. 12. Limit distribution of results. It's one of many things to be used in decisions. Especially with legislative questions, don't want responses used against the association. 13. Always use spell check. There's a "live survey edit" feature if find typo after activation. 14. Read comments before you distribute. Redact individual comment(s) only if legally essential. My pal Judith is transitioning from being CEO of an association to a new phase, and recently practiced leaving the position she has held for nearly thirty years. Spent a month in Eleuthera (Bahamas - pic by Judith), and writes in an online journal - "It's a perfect beginning for a month of learning about myself, and reinstituting the simplest of self disciplines, which I've neglected for a long time, in the excuse that I'm too busy, and other parts of life are too important." How many days (or hours) would it take for you to start to look for an Internet connection? Could you spend a month away from the office figuring out what part of your life is being neglected? Flickr, EasyShare, Shutterfly, others .. Ran into two pals who were headed to the CAE (Certified Association Executive) certification info session in Chicago. But I'm prohibited from telling anyone because (and I'm assuming everyone reading this knows how the sentence ends) ... they believe they could fail. If you ask someone if they've ever thought about CAE it's likely the words "and I could fail" are going to come up. I had great confidence when I started the CAE process .... But my friend Bob (pic) who already held the CAE strongly advised that I look at the suggested reading (to the point he immediately FedEx'd one of his books to me); and the first chapter of that first book managed to sink my confidence. I REALLY had to study. For example, didn't know a thing about credentialing, which was among the topics. Of course there were uh-oh moments where I realized a few things done incorrectly through the years because I had never just read the collective works of association management rules, laws and ideas encompassed in CAE preparation. To study: As only one CAE in my state, no local help ... so joined the Michigan ASAE online study group. Fascinating as beyond the actual content, some education is "how to take the test" ... such as "think like you're the CEO of a large national association." Very helpful tip because how an AE who is CEO of a statewide association with that set of resources would respond to a scenario is potentially different from how a national association CEO with large staff and resources would do it. Included tips like SAT takers get -- e.g., cross out the answers you aren't going to select, highlight words in the question that appear important. Those studying for CAE now have other resources -- check out both the blog and these CAE exam tips from Ben Martin, CAE. Since I hadn't taken the "don't tell anyone" approach, and did tell my officers I was studying for the CAE exam, I prepared my "just in case I fail" response: "The experience of studying for the exam was of such value to me professionally and so valuable to our association, that the designation would have just been a bonus -- the real value is the education." And it's true -- it is absolutely worth studying for the CAE exam and taking the exam, regardless of the outcome. So if you're on the fence, do it. The initial deadline to apply for the next exam is coming up -- Sept 7 (extended deadline Oct 5 for Dec 7 exam). The group I studied with online didn't fully bond as a group until AFTER the exam when we all thought we might have failed. We didn't -- My study group all PASSED. So -- check the CAE experience/education requirements, sign up, study, take the exam, pass it.